Joshua Smart pictured going to prison from Elgin Sheriff Courts. 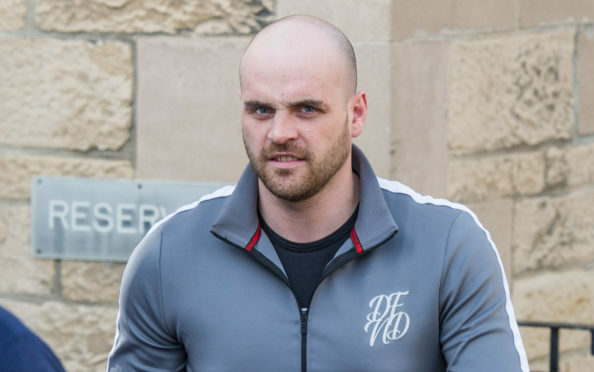 An ex-squaddie who broke into a farmhouse and helped himself to food and drink before taking a nap – and then assaulted police – has been jailed. Joshua Smart launched into a Pokemon-themed tirade against police when they found him in the property in Mulben, and threatened to break an officer’s nose. The 27-year-old had been on a romantic Valentine’s getaway when he decided to go for a walk to clear his head after drinking. But the alarm was raised when he was spotted acting suspiciously near the farmhouse. Elgin Sheriff Court yesterday heard that when officers arrived, they found three empty cans of cider, an empty bag of microwavable rice and various other food items. They then found Smart lying in bed trying to sleep, and when they asked why he was there he refused to answer – instead rambling about Pokemon character Pikachu. Depute fiscal Alex Swain said Smart became agitated and ran to the bathroom and tried to lock himself in, before becoming violent. She said: “The accused shut the bathroom door on one officer’s fingers and refused to come while uttering threats including threatening to bite one of their noses off. “They were forced to deploy pepper spray to take control of Smart and he began to calm down. Both injured officers were later taken to A&E where they were treated for soft tissue damage. Smart, of Tytler Street, Forres, admitted housebreaking, behaving in a threatening manner, assaulting a police officer and resisting arrest. Yesterday, defence agent Matthew O’Neill urged Sheriff Gary Aitken not to jail his client despite his long list of violent and drunken offences. He said: “My client had been away for a few nights with his partner and another couple to celebrate Valentine’s Day but he drunk too much alcohol which had a serious impact on his mental health issues. “He had previously spent six to seven years in the army and went on a number of tours abroad and saw a number of his colleagues seriously injured and killed and stood opposite of his best friend when he was shot and killed. Smart was jailed for 20 months.